KSA, 15 March, 2017: During the opening of the 11th ‘Flower and Garden Festival’ in Yanbu, KSA, Guinness World Records, the global authority on record-breaking, has confirmed that the Royal Commission of Jubail & Yanbu has broken the Guinness World Record for the ‘largest carpet of flowers’. 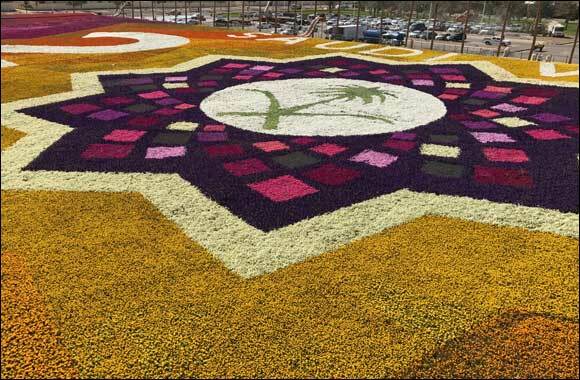 Reclaiming their title from 2014, The Royal Commission of Jubail & Yanbu commissioned the creation of the carpet for the event’s 11th edition comprising of approximately 1.8 million flowers, featuring flowers of different species, size and colour, including petunias and marigold flowers. The total area of the flower carpet is 16,134.0772 sq m. made up of 14 different types and colours of natural flowers.